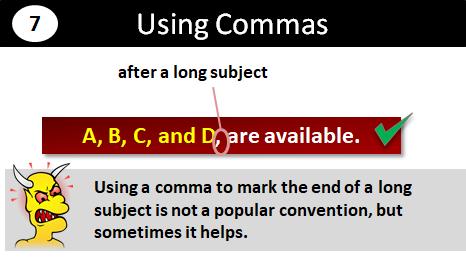 This page explains when to use commas and gives examples for each type of comma usage. Using Commas after "Setting the Scene"
In Paris, they simply stared when I spoke to them in French. At exactly 4 o'clock, two of the kidnappers re-entered the room. As you were born here, it makes sense for my group to take the map. Two of the kidnappers re-entered the room at exactly 4 o'clock. Two of the kidnappers, at exactly 4 o'clock, re-entered the room. 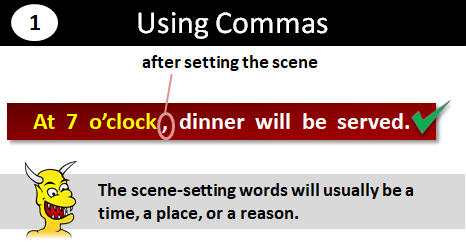 Read more about using a comma after setting the scene. John has eaten at least two cakes a day for the last decade. As a result, he has been placed in a high-risk group for diabetes. A transitional phrase (or conjunctive_adverb as you will hear them called) is never preceded by a comma. You can, on occasion, precede it with a semicolon (or a dash replacing a semicolon), but never a comma. That's called a run-on error. Oh great, the boiler's broken down. Yes, that's three out of three. I understand your predicament, but, crikey, there is nothing we can do. Note: If the interjection is to express a powerful emotion or feeling (and it's not in the middle of your sentence), then it can be followed by an exclamation mark. We all know that additional information (such as an explanation or an afterthought) can be offset with brackets. However, brackets are just one of the choices you have. 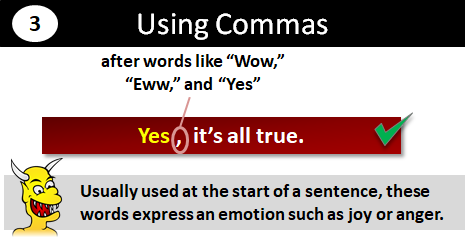 You can also use commas or dashes. The information which is offset by commas, brackets, or dashes is called a parenthesis. The punctuation marks used to offset a parenthesis (i.e., dashes, brackets, or commas) are called parentheses. At 4 o'clock yesterday, David Frost, a cleaner from the Lakes Estate, was charged with "dog napping" his former headmaster's poodle. Joanne Baxter, who originally appeared as a witness, has been found guilty of handling stolen goods. Commas are often more suitable for formal writing than brackets, as brackets can make your work look a little unorganized. Also, commas are often preferable to dashes because dashes are quite stark. The disadvantage of using commas as parentheses is they can be easily confused with other commas in the sentence because — as you can see from this page — commas have lots of uses. 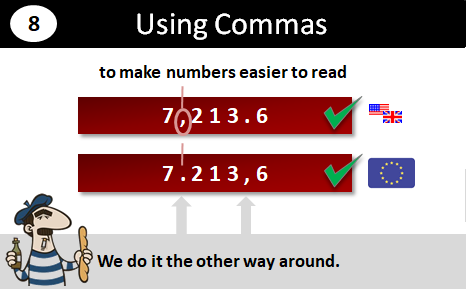 Read more about using commas to replace brackets. The big question is whether there needs to be a comma before the conjunction (in this example, the word and). Unfortunately, there is no simple rule for this. The first part of the rule is easy enough: when there are just two items in a list, there is no need to use a comma between them. However, you can use a comma if you think it helps your reader. The Bakerloo Line runs between Harrow and Wealdston, and Elephant and Castle. The bottom line is you should follow whatever convention those around you (e.g., your company seniors) follow. If there is no guidance like that, then follow whatever convention you like — but be consistent. If you have to break that convention for the sake of clarity, then have the confidence to do it. Clarity trumps style every single time. 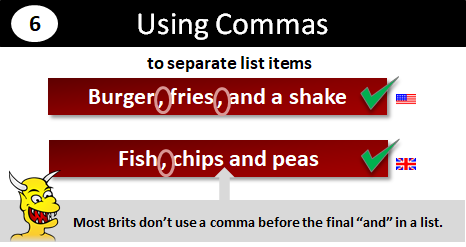 Read more about using commas in lists. Janet and John are popular. The large gorilla is popular. The large gorilla with the bright blue eyes and the albino lion cub with piercing pink eyes are popular. Leaving a list of internet passwords, increasing your life insurance, and writing a will, will give you peace of mind while you are on operations. Paul whispered, "Is he always that miserable?" Note: You don't have to use a comma. Using nothing and using a colon after the words that introduce a quotation are also options. Do me the courtesy of shutting up, Alan. Darling, can you take the casserole out the oven? I know your sister, Jason. Tell me it's good news, doctor. And that, your Majesty, is how you make Eccles Cakes. I mean, it's how one makes Eccles Cakes. 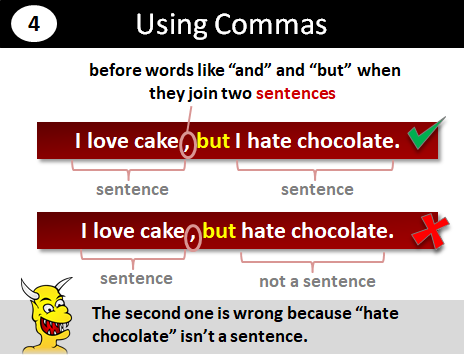 Here are some interactive tests on commas:. At school, many of us were told that a comma is where you take a breath. This is fairly good advice when you're reading someone else's work aloud. However, it is terrible advice when you're thinking about where to put commas in your own work. The rules for using commas are listed on this page. The idea that you should put a comma whenever you want your reader to take a breath is wrong. Remember, that's a reading technique not a writing technique.